It has been a while since my mother and I have dined out together. My mom is my best friend and I always look forward to our get-togethers. Yesterday she invited me out to lunch at Olga’s in St. Clair Shores, MI. I love Olga’s and haven’t dined there for at least a couple of years so I was very excited and pumped to go there. My mom had located a Groupon for Olga’s and it was a great deal, way too good to pass up! Today I will be reviewing the Olga’s location in St. Clair Shores, MI. We arrived fairly early on in the day and there were a few tables of people dining. It was not busy and I loved that because I was hangry and starrrrrving! Our waitress was pleasant and prompt. Our food arrived in a timely manner and everything was absolutely great from start to finish. Continue reading to find out more about the food that we gave a whirl! What’s for lunch at Olga’s? I am still trying to maintain a gluten-free diet and dining out at a restaurant is often challenging. I feel very limited on what I can order. I viewed the menu before coming here and I really liked what I saw for the seasonal offerings. I was planning on ordering the Kale and Roasted Apple Salad with Chicken but when I inquired about the seasonal menu when we got there the waitress informed me that they did not have a seasonal menu. I was a little stumped because it is on Olga’s website. Bummer! Oh well. Even though I eat mainly gluten-free sometimes I take a chance and order something that does have gluten in it and that was the case with the Quinoa Harvest Salad that I orderd for an appetizer. I do not believe I have Celiac Disease but gluten often puts a big-time damper on my mood (depression and fatigue) and I also try my best to avoid gluten because I like to stick with a paleo-ish diet. Wondering what was in this dish? This was a fabulous small plate to kick off my lunch at Olga’s. All of these ingredients combined to make a great appetizer for me. I loved the taste and texture of this. The Olga’s Herb Dressing was a big hit with me! Not sure of what exactly was in the dressing but whatever herbs they used, they nailed it and this really hit the spot! Olga’s has some great appetizers and small plates on the menu. When I went to Olga’s back in the day I would order the Spinach Pie every single time. Olga sure whips up a tasty spinach pie. The Greek Curly Fries looked appetizing. They probably put Arby’s curly fries to shame. They are served with a garlic-yoghurt sauce, feta, and rosemary. Gala Apple Pecan Salad for me! So instead of ordering a salad from the seasonal, limited time only menu, the Gala Apple Pecan Salad really caught my eye on the menu. It is fall, after all, and I can not think of a better topping on a salad this time of year than apples! The salad sounded pretty exciting to me! It consists of field greens, Gala apple, red onion, feta, cranberries, candied pecans, and a white balsamic to top it with. I ordered mine as a medium and I added some grilled chicken to it. The other meat options include grilled chicken, Atlantic salmon, flat iron steak or Olga’s seasoned beef and lamb (at an additional cost). My salad came out to the table and I thought that the presentation was nice and I could not wait to tear into that salad! The medium size was the perfect lunch size portion for me. I was happy with the number of toppings and grilled chicken on it. This was my first time trying out a white balsamic dressing. I was not even aware that a white version of it existed until yesterday. This salad really pleased my palate. The acidity of the balsamic paired well and balanced out with the sweetness of the Gala apples. The pecans were a nice added touch to elevate and enhance the texture of the salad. I was kind of torn on what salad to order. It was either going to be the Gala Apple Pecan Salad with chicken or the Mediterranean Salad with salmon. The Mediterranean Spinach Salad is composed of spinach, cucumber, grape tomato, red pepper, feta, kalamata olive, pepperoncini, tortilla strips, and Olga’s famous herb dressing (the same dressing that was on the Quinoa Harvest Salad). I bet that is a winner(!) winner(!!) salmon salad! This was, believe it or not, my mom’s first time ever going to Olga’s she claimed. I could have sworn that we went here together years ago but she insisted that yesterday was her first time. She ordered a cup of Olga’s Peasant Soup and she ordered a Chicken Shawarma Olga to go along with it. My mom’s soup looked so wonderful and hearty! I was a tab bit jealous of her soup, I must say! She really enjoyed it and she loved those little dippers that the soup came with. Those little “crackers” on the side are Swiss Almond Cheese, traditional seasoned Snackers that Olga created. I did not try them but my mom sure did and she said that they were fantastic. No doubt and I bet she was right! What’s on the Chicken Schwarma? My mom enjoyed her first Olga and kept on telling me how she can not wait to come back and how glad she was that she purchased that Groupon. Hey! I am totally down for that. I would love to return soon as well. Olga’s started out in the 1960’s with Olga Loizon as the creator and innovator. 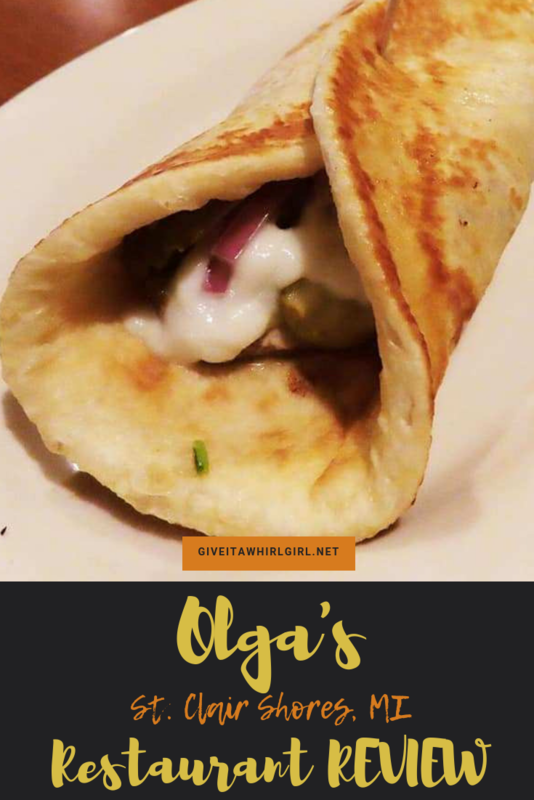 Olga’s is known for their original Olga sandwich that is seasoned beef and lamb, vine-ripened tomato, sweet onion and her homemade Olgasauce wrapped in pita bread. Olga worked hard to perfect her bread recipe and it shows. Since going gluten-free (mostly) I no longer eat regular bread but I can attest to the fact that Olga’s cranks out some tasty stuff! Olga’s has a wide variety of items and I believe that their menu has something for everyone. The Classic and Signature Olga’s are the hot sellers. They also have a nice selection of salads if the pita wraps are not your thing. If you want to be smart here you will go with their value meals where you can get a combination of items, like soup and a salad. You can view the entire menu of Olga’s online so you can decide ahead of time what you are going to go with. Hope you all enjoyed this Olga’s review. Now it is question time! If you have dined at Olga’s what is your menu item of choice? If you have not yet visited Olga’s what would you order? Check out their online menu to see what the choices are. This entry was posted in Local Spots I Visited and tagged apple, balsamic, chicken, chicken shawarma, family restaurant, Olga's, peasant soup, pecan, pita, restaurant, review, salad, soup. Bookmark the permalink. Good choice! Their spinach pie is great!